Creating a canvas for your artwork! Gathering 2013 was my favorite so far. I had so much fun! This year afforded a lot more hanging out then in years past, which really increased the fun factor. I have known many fellow Gathering attendees for many years, and met a lot of great new people, as well as got to spend time with many people I generally just see in passing. I won’t list all the great folks whose company I enjoyed, but this was tons of fun, and thank you to everyone who spent time with me! You were all great!! This was the first year I taught at the Gathering. I instructed to mini workshops, 7-10pm on Wednesday and Thursday! I went knowing Wednesday was full, but Thursday only had 4 people enrolled. I was so excited that Wednesday went so well that I had several more people sign up for Thursday giving me 2 full classes!! We discussed how to approach shaping tools and how to trouble shoot when things aren’t going quite right. The students did a great job and everyone said they learned what they were hoping to, so that was all I could hope for! Ellen Gaimari and Kerry Bogert were fabulous TAs and I enjoyed my time with both of them. We had a smaller number of attendees this year, but a very supportive group. Thank you to everyone who supported us and the other vendors! Inspiration was bountiful this year, as is always expected. I was able to several of the presenters because the vendor area was right next door so I could slip in, watch for a while and still be around for my parents and customers with questions. It was a great set up. Jen Geldard did a fabulous demo of adding small glass components in the flame. I’m itching to try that. Holly and Ali made me green with envy over their stringer control and ability to work on one thing for hours. Not my nature at all, but I am going to try to extend the time I work on one piece, just to see where I can go with that. Libby showed how she makes her beautiful silvered glass pods, and I fully intend to give it a go. I liked how she worked logically in a specific order, so the steps didn’t get in each other’s way. I also loved her perspective on glass, and our history. She pointed out that if you were a painter and had the opportunity to talk the the greats of the past, that gave the foundation of the art, like Picasso and Renoir, of course you would. We are lucky to have our Picassos and Renoirs in the room with us, at the Gathering, and we should take the opportunity to talk with them, watch them, learn from them. I got bits and pieces of a couple other presentations and was impressed with what everyone was sharing. The Bead Bizarre was stunning. Getting to see the work up close, talk to the artists and and be inspired. It’s one of my favorite parts of the Gathering each year. The show that was onsite had some absolutely amazing pieces in it. The talent in the members of the ISGB is really awe inspiring. I talked for quite some time with Dvora about her piece, and was amazed with the amount of time spent on not just the whole necklace, but each individual piece. 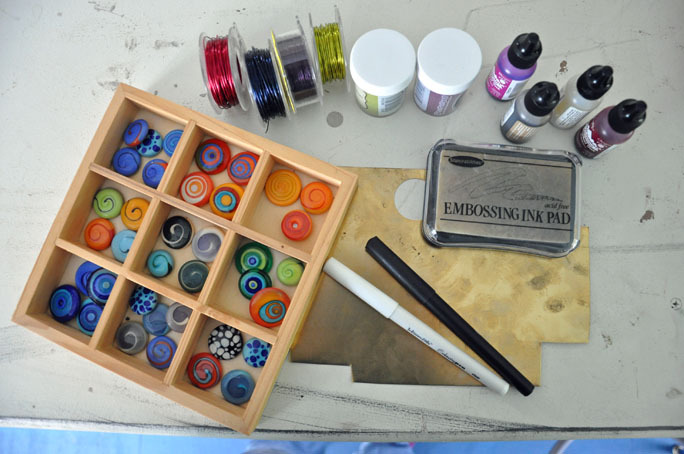 She made cabochons one of which was done using a technique she learned from Bronwen that involves painting on glass and several firings. Another was made by layer two colors of glass and carving into the top layer to reveal the one underneath, add to that some stunning silver work, itty bitty spacers, a blown glass piece that held the most beautiful beach sand I’ve ever seen. It was amazing. And talking to her was the highlight of the show for me. I came home with glass, tools and other random goodies, along with lots of inspiration to get back to the torch. Oh, and Beads of Courage was there, and they need more beads! So if you have some time to make up a batch and send them along, they would really appreciate it. After the Gathering I stayed an extra couple days to hang out with the fabulous Kerry Bogert. She was the most delightful hostess, and her family was so great. We had a lot of fun, including a marathon day of antiquing, checking our her fabulous Interweave press library…since she is the Acquisitions Editor for Interweave now, she has a wonderful selection of books. I found a couple I need to pick up, and ordered another that isn’t from Interweave but is self published and is the most beautiful book about glass beads I’ve ever seen. I’ll tell you all about it when my very own copy…ordered on the spot from Kerry’s living room, arrives. I also got to meet the horses that reside near her studio, check out her studio, where I got to see her well loved ZooziiTools all neatly arranged, and relax on her deck. I had wonderful pictures of all the fun, but had a phone malfunction, so there is not much to show, but I’m looking forward to Houston 2014! Will you be there too? I hope so. I just got news that at the Rochester NY Gathering of the International Society of Glass Beadmakers, I will be teaching 2, that’s right TWO classes. Both will be 3 hours long, and will cover the basics of how to approach presses/shaping tools. When you get your new tool, whatever the shape is, how do you look at it and know the steps to lay the glass and fill the cavity? The class will be geared towards folks who are new to presses, or folks who have played with presses but have never achieved the desired results. The class will be filled with instruction, tips and tricks, as well as time for one on one coaching. I’m super excited and my brain is cycling a million miles an hour with all the fun we will have and some exclusive treats for those who join me in Rochester!! I’ll post when more information is available, and when you can sign up for the Gathering and the ZooziiClasses! ArtBliss is a wonderful event! The coordinators, Cindy and Jeanette, pay such excellent attention to detail that all the little things, as well as the big things were so seamless. The teachers they assembled were a wonderful group. I had fun talking with all of them and was certainly jealous of some of the other folks who took classes that I couldn’t, due to scheduling conflicts. I wouldn’t have given up Kerry’s classes, but would have loved to have been two places at once! If you are in the DC area, the event is something to check out, but I did drive 9 hours, and it was worth the trip, so don’t feel limited if you don’t live in the area. I met many great artists and authors. Stacie Florer is a talented woman and a delight to talk with. I would have loved to have taken a class with her! Maybe next year. Lori Anderson was there with her book “Bead Soup”. I received a signed copy and have had lots of fun thumbing through it! What a fun idea for a book. Kerry Bogert taught the technique of embossing on metal. I have been wanting to play with metal for a long time, and just never get around to is, so the class was a great nudge. We used a cold technique, from her new book Rustic Wrappings, to make a bezel for an awesome cabochon made by Kerry. Then we used the embossing to finish the metal. It was a great time. Kerry is a lovely teacher. She’s enthusiastic about her medium, and about teaching, and she’s does an excellent job of explaining the steps involved. If you have a chance to take a class with her, it would be a great time for sure! The next morning we headed to the Workhouse Arts Center. What an amazing place! If you live in that area, it’s a wonderful resource that you should check into. They have a beautiful gallery with works from the artists in residence. There are open torch times available, as well. The Virginia Firebirds, a new ISGB Chapter, gather there for their meetings, as well. Another great opportunity to meet other lampworkers, share ideas and talk about glassy things! I demonstrated several of the ZooziiTools, presses and mandrels. We discussed how to approach a new shape, and I shared tips and tricks for adding and removing glass. It was a great group, and we had a lot of fun! Zoozii’s is Going on the Road! If you live near Lorton VA, I hope to see you at the demo I’m presenting at the Workhouse Arts Center! On Sunday, September 23, from 1-3 I will be demonstrating the tools, followed by an opportunity for you to use the tools with coaching! I will have a modest inventory with me for purchasing at the demo. You will have a chance to ask questions, learn how I approach a press, get one on one coaching, and have a grand ole’ time! If you are coming and want to email me ahead, I can bring down orders for you, which will ensure I have what you want with your name on it ready for you. Maybe you have a tool you’ve been debating, but you’d like to see first hand, let me know that and I’ll bring it down, and you can decide on it down there. Finally, if there is a tool you’d like to see in action, I’m taking requests! So let me know what you’d like to see demonstrated. This is going to be a heap load of fun, and I’m super excited! I hope to see you there. Now for the exciting news that pertains mostly to me…hehehe… I’m going to spend the whole day on September 22 taking classes with Kerry Bogert at ArtBliss!! I’m going to be learning some of her awesome lampwork/metal techniques from her new book “Rustic Wrappings”. I’m also taking her photo class, in the hopes my bead photography can improve making for more bead pics on the Zoozii’s site, as well as sharing my work and even selling it. It’s piling up since the Gathering, but my pics are frustrating me. I’m excited to learn from Kerry, who has totally awesome lampwork pictures! The kit for Kerry’s class…doesn’t that look fun! There are still more spots. Join me! Are you going to ArtBliss? Can you come to our fun Demo afternoon? We have lots of fun on Facebook! Join us! We'll be at the Gathering! Hope to see you there.